We are a reputed manufacturer and wholesale supplier of high quality LED Signage range. We fabricate these signage boards in light weight but strong in construction to provide better durability. Also our ranges of signboards are available in customized sizes and designs as per the client’s requirements. These signs are caution signage, security signage, plastic signage, hip yellow plastic signage, industrial signage, cautionary signage. 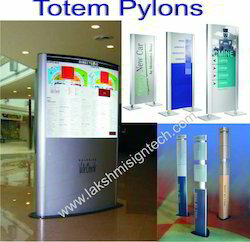 Our company manufacture a wide range of Totem, Pylon.These are manufactured with the help of high quality imported anodized Aluminum profile raw material. Great to Directories Showrooms, Lobbies and Display sin Environments, including Parking, Garages, Airports, Hospitals, Office Buildings, Campuses, and Libraries, etc. All these Architectural Signage boards can be availed in different designs and sizes as per the specific requirements of our clients. These ‘value for money’ products offered in different colours, high tensile strength and corrosion resistance. 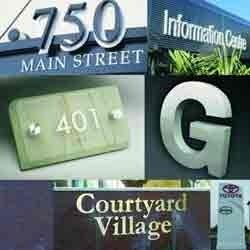 This range of signage involves reception signs, hanging displays, direction signs, floor graphics etc. Looking for LED Signage ?